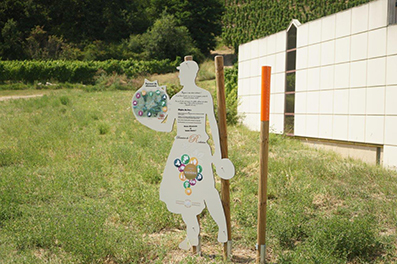 In 2018, the Cave Saint-Désirat set up a 3 km trail for discovering the Domaine de Rochevine (Winery Domaine), with the help of ten entertaining and instructive stations that will enable walkers to discover the history of the Winery and the vineyard. A route guide is available on request. This walking trail is a real chance to observe Nature, the local flora and fauna. 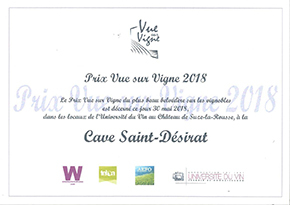 This Trail has been awarded the “Views of the Vineyards” prize 2018. 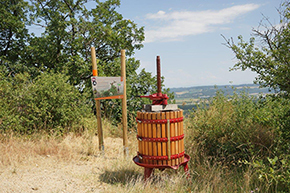 This prize is aimed at distinguishing and promoting the finest views over vineyards in France. Leave your car in the large car-park at the Wine Centre, close to the N86 road between the villages of Saint-Désirat and Champagne. 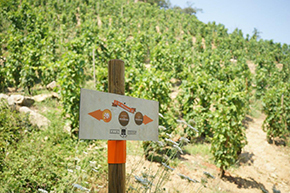 The Trail starts at the end of the car-park running alongside the winery and climbs up onto the slopes. An original passage “underneath” the former Peyraud–Annonay railway line gives you access to the Rochevine Gallery.